One thing that did strike me was that modest apartment and guesthouse accommodation was available for budget travellers. I didn't examine any but they seemed in good repair. There are no campgrounds and no tenting is permitted which seems a shame. A well-built and organized campground could diversify the tourists, in my opinion. Dining on Nevis was never a problem but phoning ahead to ensure places are open (and if reservations are required) is a good thing to do. We ate in everything from "snackettes" (fried chicken and Johnny-cakes) to stellar dining rooms with lavish spreads. I'll give a quick summary of our dining experiences at the end of this report. It became important to us to get "the lay of the land", so we read the local newspapers and spoke to as many residents possible in our limited time. We became marginally concerned about local politics and the power-brokering that goes on. A land sale by the government to relatives/friends at about five cents on the real dollar value was raised in one article! Admittedly short of factual information, we further heard of unrest with workers at the Four Seasons and the dissatisfaction of service people, like taxi drivers and tour operators who derive their income from the guests. Yes, the resort does employ up to 600 residents but it is evidently under a strict hierarchy and control system of wages and commissions. On a more common issue was the proposal to literally remove Hurricane Hill (hundreds of thousands of tons of rock), destroy Lovers Beach (home of endangered turtles and sea life) with the fill, build a massive hotel and expand the airport to handle 747's! Not only is this outrageous in my opinion, it impacts many residents in the immediate area that currently enjoy a very lovely portion of the island, to say nothing of the over-all impact on the entire island. To some this may be progress but if ever fully conceived, it will spoil many of the reasons to come to Nevis. That was my rant. On to some lasting memories that start with the tree frogs that serenaded us as night fell. There were wonderful butterflies, hummingbirds, frigate birds, terns and pelicans to delight us at home or on the beaches. The ever friendly and obliging residents who made us feel at home no matter where we roamed. The spectacular Botanical Gardens dazzled our senses. The golden sands of nearly deserted beaches were what we had dreamed of. The absence of trash made this one of the cleanest places ever visited. The politeness and decorum of the children (and teens)…never a curse word was heard in thirty days or a smile not offered. Laughter and happiness seemed to prevail in all public places. Some of most wonderful characters one could hope to meet extended from taxi drivers and waiters, to hosts/hostesses of restaurants and tour operators, to neighbours and now…new friends. In this latter instance, one highlight of our vacation that deserves special mention was to sail around the island of Nevis with Captain Les Windley. There were just the three of us on his forty-four foot sailing sloop, the "Sea Dreamer". (Please do not confuse this true sailing vessel with the "touristy, catamarans".) A full day to circumnavigate and listen to Cap'n Les' tales of his sea faring days, ocean crossings and exploits will stay with us forever, along with the complete Nevis vistas so few are privileged to observe from both the Atlantic and Caribbean seas. 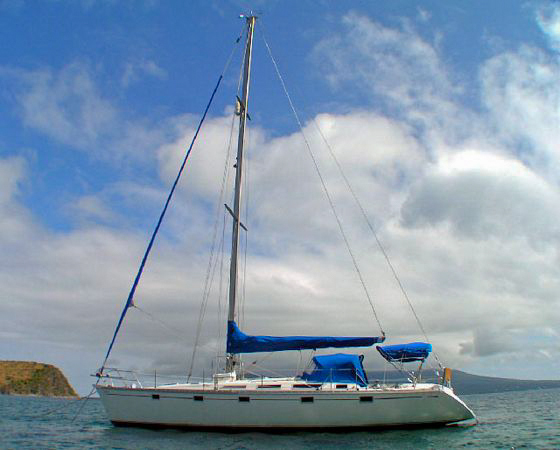 "Sea Nevis Ltd." is where this salty captain can be found for full and half-day sailing adventures. It may be noticed that little has been said about St. Kitts. We day-tripped, twice and frankly, were over-whelmed by the crowds and activity…relative to being spoiled by the serenity of Nevis. As any reader may have gathered, Nevis provided our vacation of a life time and we intend to repeat the process as soon as possible. Return to Part 3 of Richard's 4-Part Nevis Villa Review. 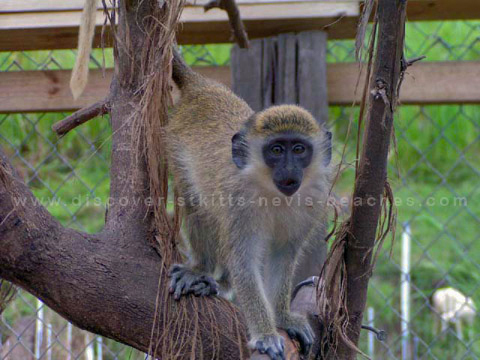 Read more reviews at the St Kitts Nevis Reviews Main Page.